Thousands of disabled get treated free of cost. Feel the synergy of dedicated professionals joining hands to heal. See the joy on the faces of those cured. Come, be a part of this mission to IMPACT India�. Anaemia reduction for a group of 50 adolescent girls (potential mothers) : INR 50,000/-. 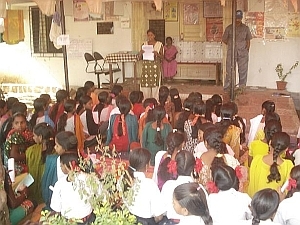 Ante Natal Care & Imunization for 100 women and 250 children : INR 500,000/-. Capacity Building for 50 Government health staff & Viillage volunteers : INR 3,20,000/-. Nutrition for one Mother & Child : INR 25,000/-. Impact India Foundation is a charitable organisation. All donations are exempted 100% from Income tax u/s 35 A.C. and/or 50% u/s 80-G of the Income Tax Act, 1961. Make a donation on a secure connection with your credit card. Bank Name: Kotak Mahindra Bank Ltd. Address: Ground. Floor, Bhagat Niwas, Bhagat Tarachand House, 154/156. Opp Cotton Exchange, Mumbai- 400 002. Kindly specify the reason for remittance as "a donation". Nhava House, 65 Maharshi Karve Road, Marine Lines Mumbai 400 002, INDIA. Mumbai 400 002, Maharashtra, India. For bulk orders and any other queries kindly contact us and we will be happy to assist you.